Place chicken breast-side down on a cutting board. With kitchen shears or a very sharp boning knife, remove the backbone by cutting down either side. Turn chicken breast-side up and press firmly on the breast bone until you hear it crack and chicken lies just about flat. Run the chicken with olive oil and season well with salt and pepper. Gently loosen the skin over the breast and slide lemon slices and thyme under the skin over the breast meat. Weave two metal skewers through the chicken, criss-cross – catching leg and breast meat along the way. Prepare a grill for medium-heat cooking. Place chicken on the grill skin-side up; cook, flipping frequently until it is well-browned and cooked through, about 30 minutes. An instant-read thermometer inserted into the thickest part of the thigh and breast without touching bone should read 165°F. Transfer to a platter and let rest 10 minutes before carving. Meanwhile – make the Brussels Sprouts. Heat olive oil in a large, heavy pan. Add garlic and shallots and cook for 1 minute. Add Brussels sprouts and stir to coat. Add salt, pepper and brown sugar. Cover, leave to brown, stirring occasionally, until vegetables are brown and tender. 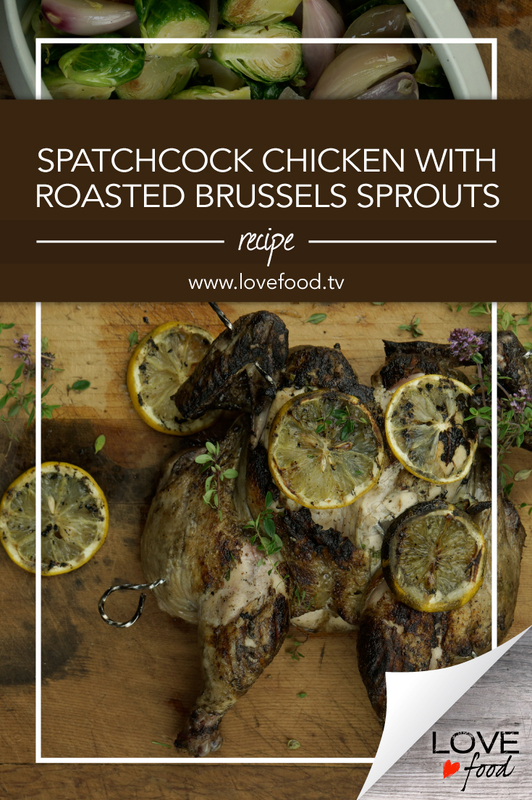 *Spatchcocking means removing the backbone of the bird so it will lay flat on the grill. This speeds things up, and allows for even cooking.